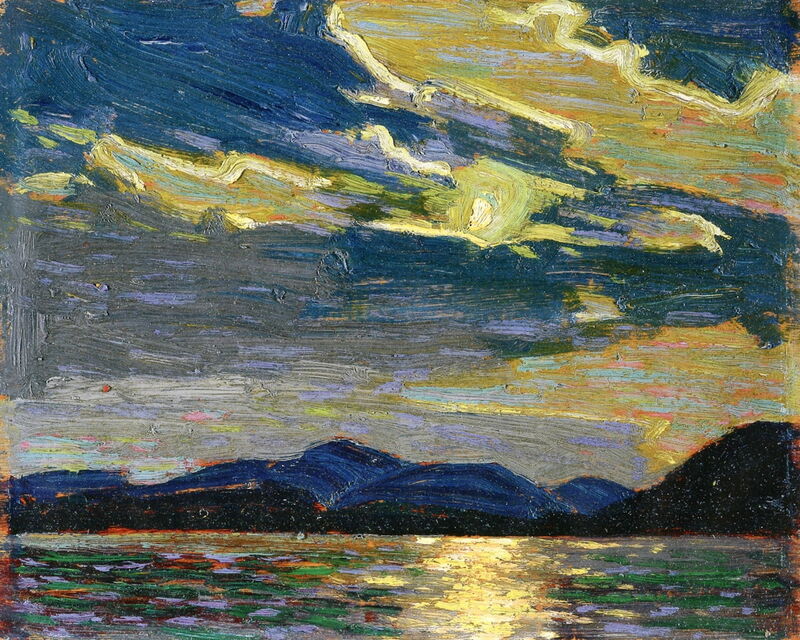 Tom Thomson (1877–1917), Hot Summer Moonlight (1915), oil on wood, 21.4 x 26.7 cm, National Gallery of Canada / Musée des beaux-arts du Canada, Ottawa, ON. The Athenaeum. 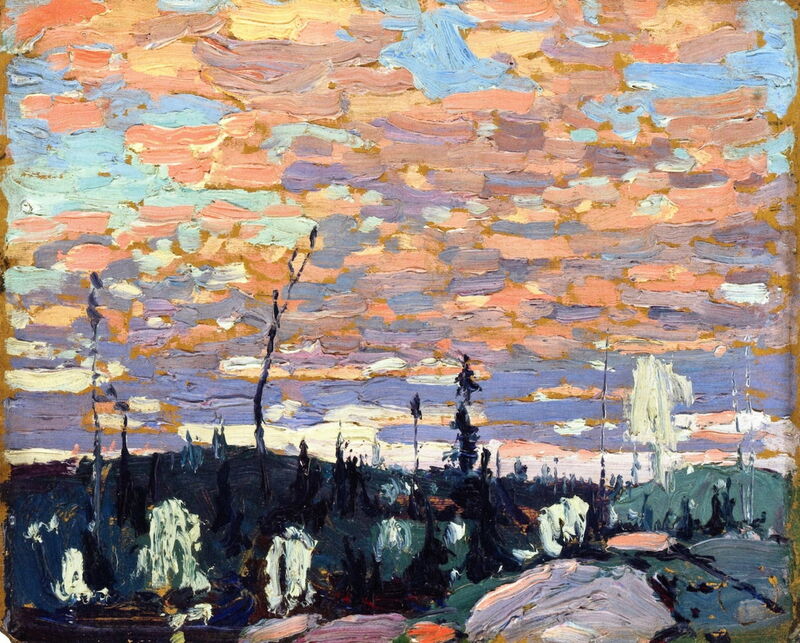 At the end of 1914, Tom Thomson was rapidly becoming a well-known painter. 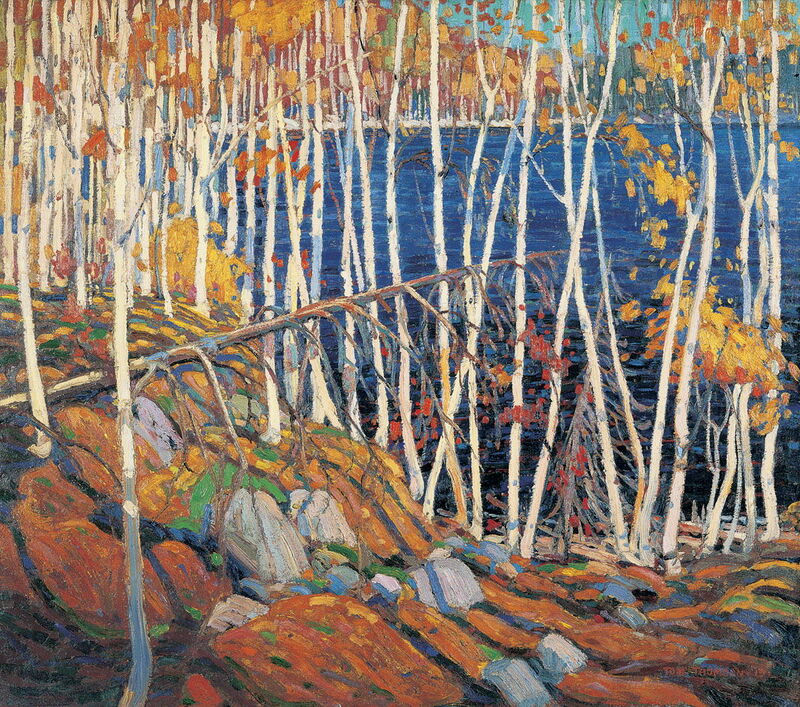 He had a patron in Professor MacCallum, his paintings were being bought by the National Gallery of Canada, and he had a seemingly inexhaustible supply of motifs in Algonquin Park and the wild areas near Georgian Bay. With some money coming in from his paintings, Thomson was able to buy himself a new cedar-strip canoe and a silk tent, which he used heavily during his trips the following year, 1915. This was apparently his most prolific period, so I have divided my selection of those works across this and the next article in this series. Tom Thomson (1877–1917), Northern River (study) (1914-15), graphite, brush and ink and gouache on illustration board, 30 x 26.7 cm, Art Gallery of Ontario, Toronto, ON. The Athenaeum. Thomson probably make this sketch study for Northern River during the late autumn/fall in Algonquin Park, using mixed media including pencil, ink, and gouache. Tom Thomson (1877–1917), Northern River (1914-15), oil on canvas, 115.1 x 102 cm, National Gallery of Canada / Musée des beaux-arts du Canada, Ottawa, ON. The Athenaeum. 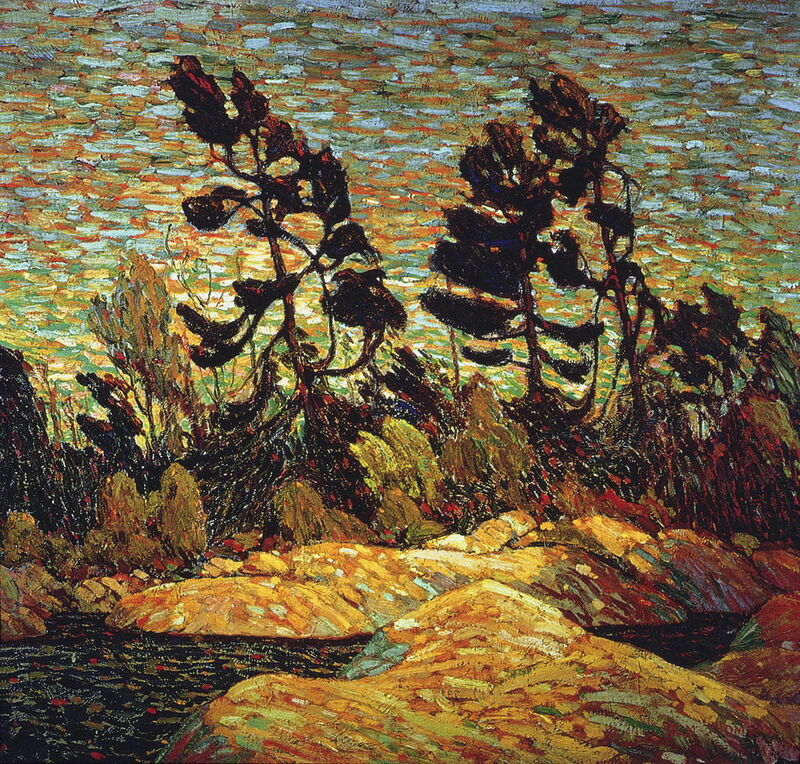 Then, working during that winter in his live-in studo in Rosedale, Toronto, he produced this full-sized work in oil on canvas, Northern River (1914-15). This retains the fine detail which had been typical of his earlier and more realist works. When it was exhibited in 1915, this painting was bought by the National Gallery of Canada for $500. Tom Thomson (1877–1917), Byng Inlet, Georgian Bay (winter 1914-15), oil on canvas, 71.5 x 76.3 cm, McMichael Canadian Art Collection, Kleinburg, ON. Wikimedia Commons. 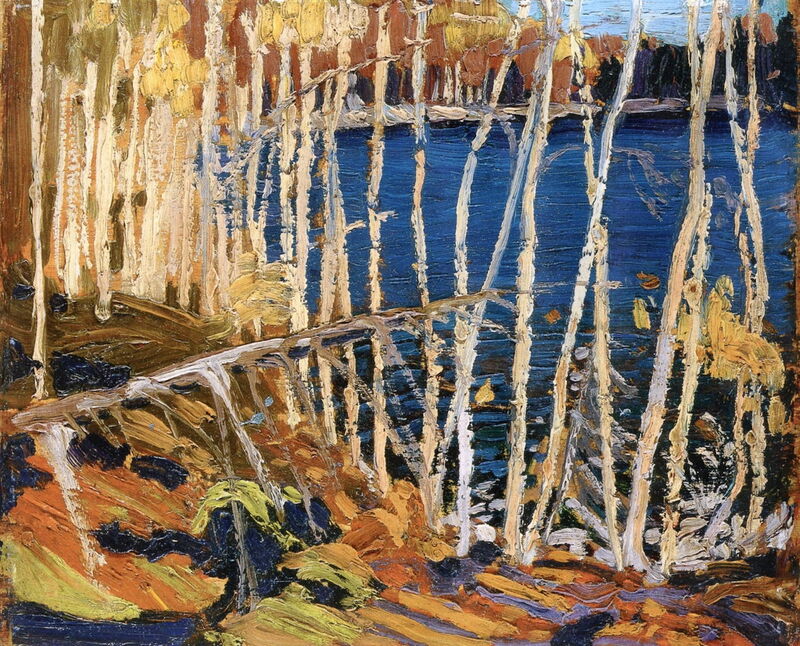 Over the same period, he painted this finished view of Byng Inlet, Georgian Bay (1914-15), still showing the colours of the autumn. Tom Thomson (1877–1917), Wild Cherries, Spring (1915), oil on composite wood-pulp board, 21.6 x 26.7 cm, McMichael Canadian Art Collection, Kleinburg, ON. The Athenaeum. Thomson seems to have got out early in the Spring, at least to Algonquin Park, where he probably painted Wild Cherries, Spring (1915). The sky here appears to show influence from some of the more coarsely-divided paintings of the Neo-Impressionists, with its broken brushstrokes of rich and contrasting colour. It was about this time that Thomson standardised on using 8.5 x 10.5 inch composite boards for his plein air oil sketches, which may have been selected to fit his favourite pochade painting box. Tom Thomson (1877–1917), Abandoned Logs (1915), oil on composite wood-pulp board, 21.6 x 26.6 cm, McMichael Canadian Art Collection, Kleinburg, ON. The Athenaeum. 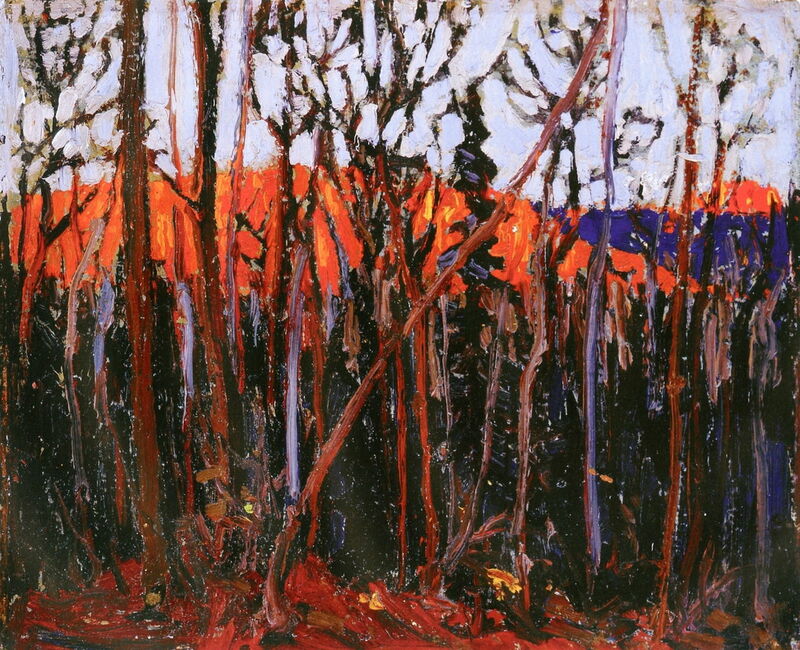 Abandoned Logs (1915) explores the rich reds of the sunset. 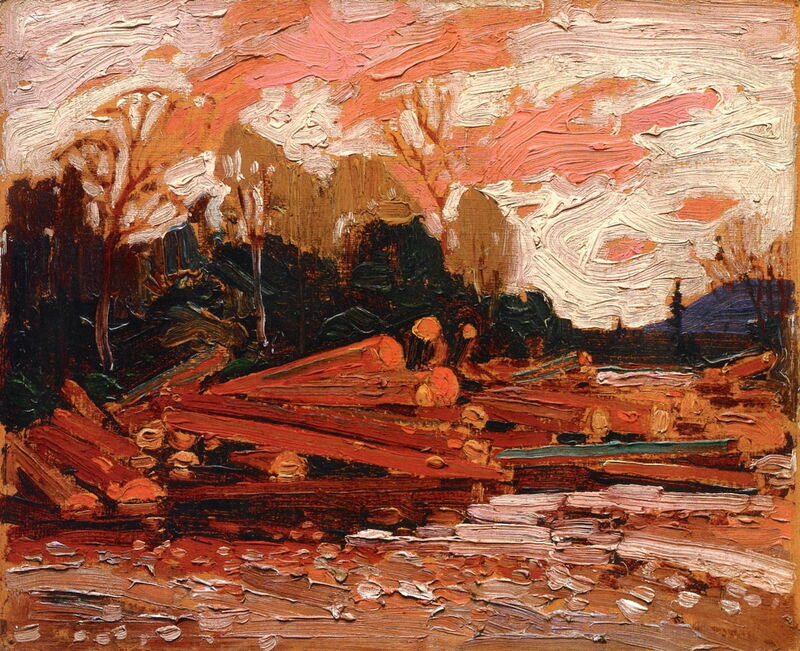 Tom Thomson (1877–1917), Burnt Land at Sunset (1915), oil on composite wood-pulp board, 21.6 x 26.8 cm, Private collection. The Athenaeum. Thomson did not confine his paintings to the aesthetically attractive. 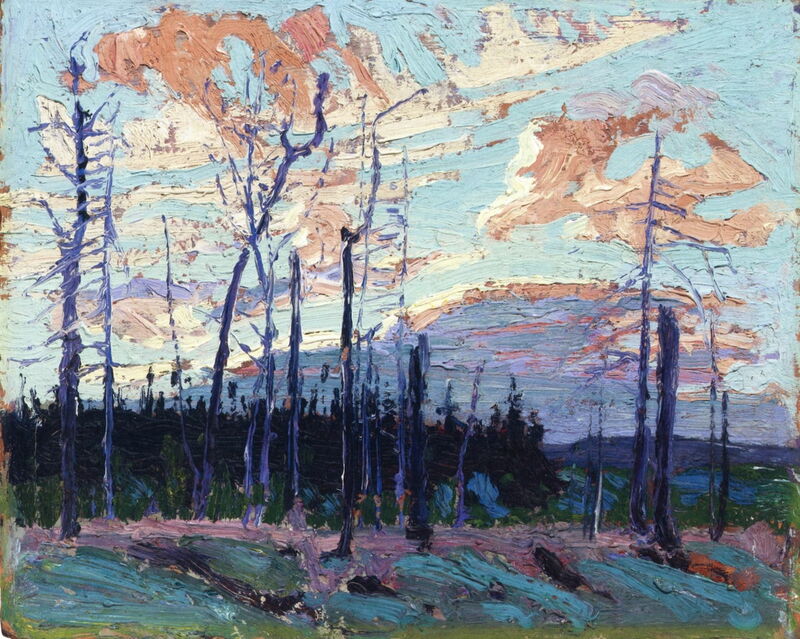 Several of his paintings showed the effects of forest fires, including Burnt Land at Sunset (1915), which features much cooler colours than most of his paintings. 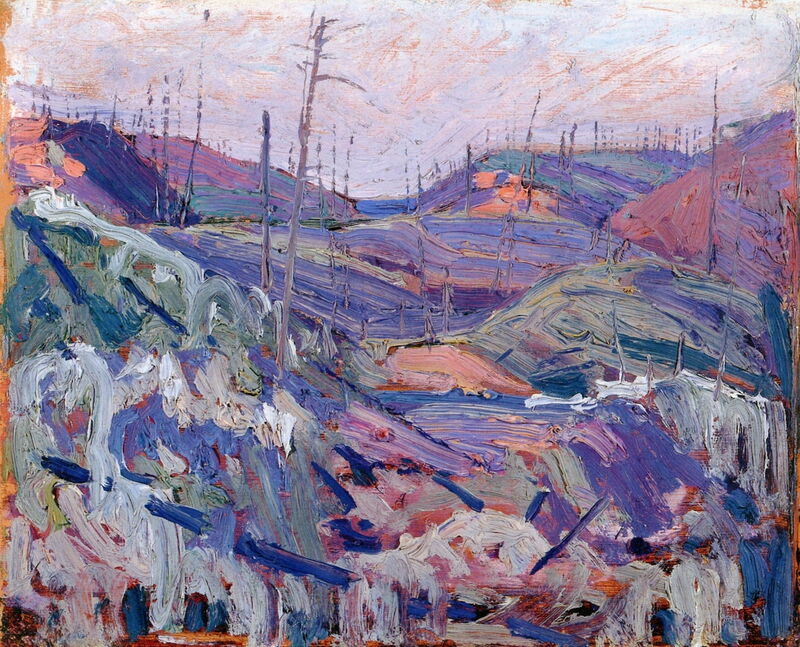 Tom Thomson (1877–1917), Fire-Swept Hills (1915), oil on composite wood-pulp board, 23.2 x 26.7 cm, Art Gallery of Ontario, Toronto, ON. The Athenaeum. As early images were returning to Canada of the appalling conditions in the trenches in Europe, during the First World War, those may have inspired Thomson to paint his Fire-Swept Hills (1915). Tom Thomson (1877–1917), Algonquin Park (1915), oil on composite wood-pulp board, 21.6 x 26.5 cm, Tom Thomson Art Gallery, Owen Sound, ON. The Athenaeum. 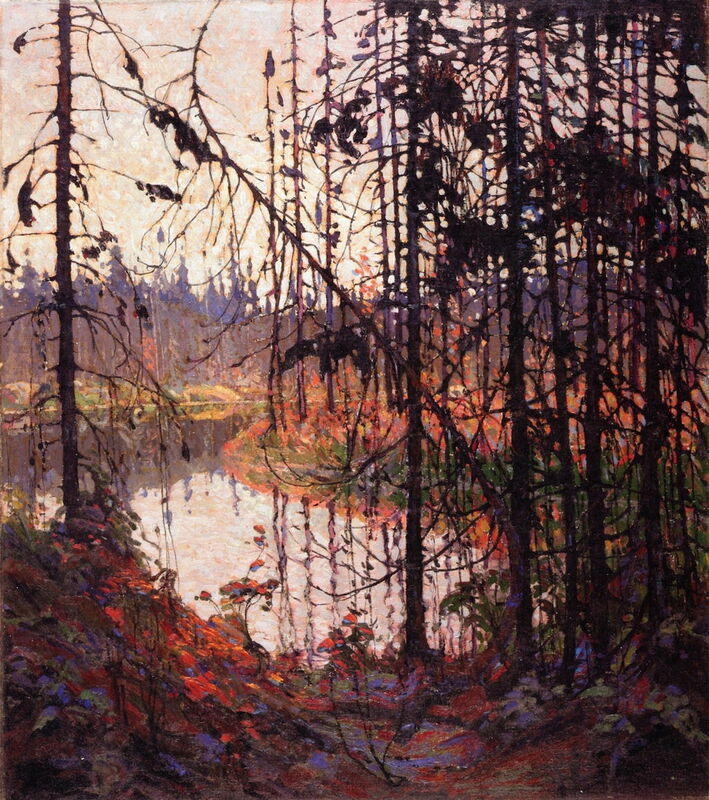 The combination of twilight and the autumn season, as shown in Thomson’s Algonquin Park (1915), resulted in these intense colours. Tom Thomson (1877–1917), Black Spruce and Maple (1915), oil on wood panel, 21.6 x 26.7 cm, Art Gallery of Ontario, Toronto, ON. Wikimedia Commons. 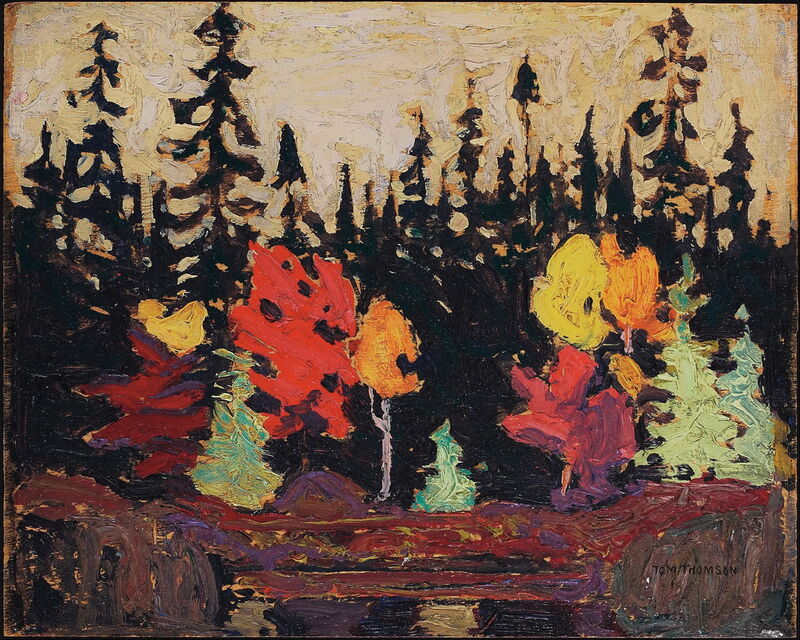 In Black Spruce and Maple (1915), Thomson used the natural colour contrasts between the greens and blacks of fir and spruce, and the rich oranges and reds of the maples in autumn. Tom Thomson (1877–1917), Blue Lake: Sketch for In the Northland (1915), oil on wood, 21.7 x 26.9 cm, National Gallery of Canada / Musée des beaux-arts du Canada, Ottawa, ON. The Athenaeum. Blue Lake: Sketch for ‘In the Northland’ (1915) was another of the dozen or so oil sketches which he later worked up into larger finished works on canvas. The lake is here partially obscured by a palisade of young deciduous trees, a compositional form which first reached prominence in the paintings of French Impressionists such as Pissarro, although it may have originated with Corot – what I have termed grillage for want of a better name. 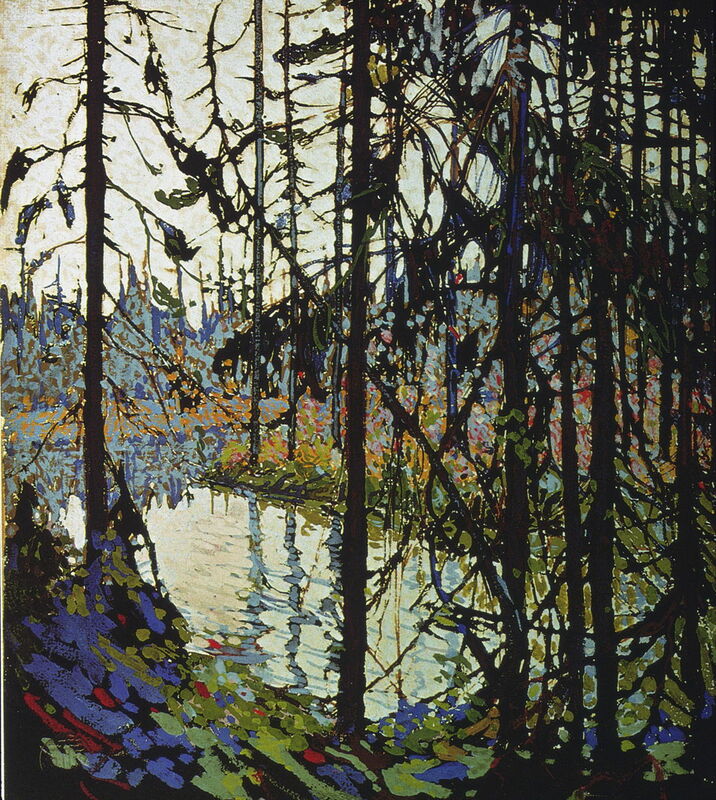 Tom Thomson (1877–1917), In the Northland (1915), oil on canvas, 101.7 x 114.5 cm, Musée des Beaux-Arts de Montréal, Montreal, QC. The Athenaeum. Thomson’s finished painting In the Northland (1915) is even more elaborate and detailed than his sketch. He seems to have painted finished studio versions in only a dozen or so of his works; this was much more common practice among the other painters who later went on to form the Group of Seven. He was also unusual among his contemporaries for the large number of nocturnes which he painted, such as Hot Summer Moonlight (1915). Most of these appear to have been sketched, probably using his pochade box, from his canoe: he would paddle out into the middle of a lake under the moonlight on a calm night, and paint while the canoe was left to drift slowly. This work is notable for its contrasting colours in the water.